Home Styles Biscayne 5-Piece Set includes 48-inch Round Outdoor Dining Table and Four Swivel Chairs. Set is constructed of cast aluminum with a black finish. Features include powder coat finish sealed with a clear coat to protect finish, attractively patterned table top has center opening to accommodate umbrellas, and nylon glides on all legs. Biscayne 5-Piece Patio Dining Set with 48-inch Black Table and 4 Swivel Chairs Home Styles Biscayne 5-Piece Set includes 48-inch Round Outdoor Dining Table and Four Swivel Chairs. Set is constructed of cast aluminum with a black finish. Features include powder coat finish sealed with a clear coat to protect finish, attractively patterned table top has center opening to accommodate umbrellas, and nylon glides on all legs. Biscayne 5-Piece Patio Dining Set with 48-inch Black Table and 4 Swivel Chairs is rated 1.0 out of 5 by 1. Rated 1 out of 5 by RickinMS from The black patio dining set was easy to order online. Shipping was fast and I received a shipping ... 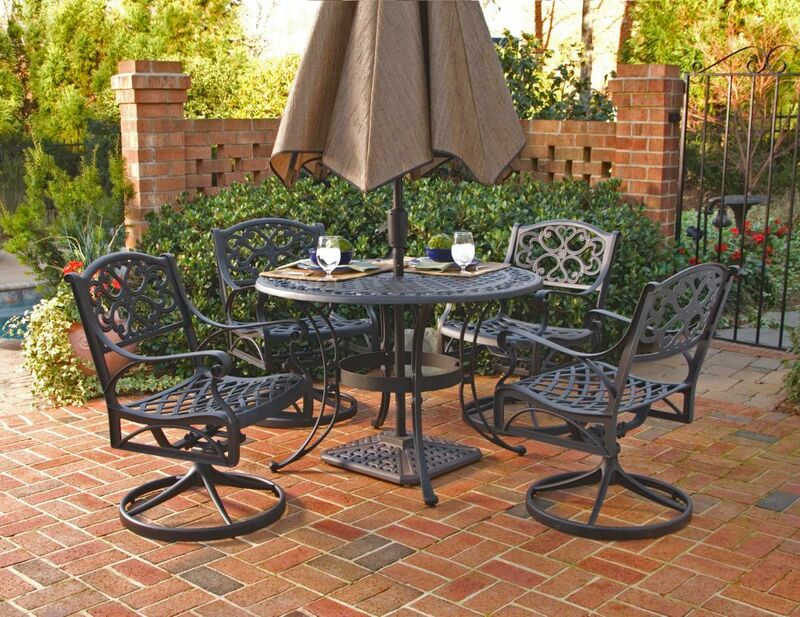 The black patio dining set was easy to order online. Shipping was fast and I received a shipping call the day before delivery. The 5 packages were well-packed. It took about 2 hours to put the set together. It's relatively easy but very tedious. The table and one of the chairs had scratches (spots where there was no finish, just raw metal). I called Home Styles for touch-up paint (as other reviews noted this was available). First call, I left a very detailed voice mail (model number, purchase order number, customer number, etc.). Got a response the next day asking me to call them back or email my issue. Second call I waited for a real person; after waiting I was put into the voice mail cue (no way back without starting the call over). I sent a detailed email addressing my issue. One week later, no response to my email. My call today resulted in the voice mail cue after waiting ~5 minutes for a rep (supposedly I was next in line). Having the set now for 2 weeks, I believe the set is nice but I think it's overpriced. I also think that a company that has such poor customer service is one I will never buy from again. Home Depot should be ashamed of doing business with such a company.